Two weeks after Election Day, Minnesota election officials across the state are doing a massive redo to count votes in the state's U.S. Senate race. City and county workers at 107 sites began the long slog through more than 2.9 million ballots in the race between incumbent Republican Norm Coleman and Democrat Al Franken. They have until Dec. 5 to complete the job. Coleman led Franken by 215 votes in unofficial results, triggering an automatic recount. At the elections warehouse in northeast Minneapolis, the vote-counting picked up as the day went on. Elections officials in the city currently have six tables of vote counting going on, but may increase that to 10 tables when the process starts running more smoothly. As elections officials recount the Senate votes, they may want to remember an old phrase that says the best way to eat an elephant is one bite at a time. In Minneapolis, the first bite was Ward 1, Precinct 8. 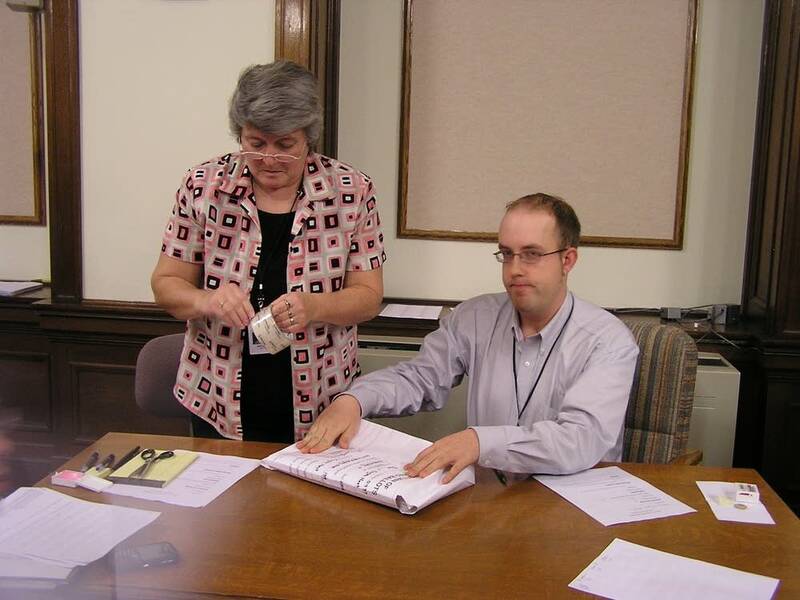 Jane Schallert and Steve Peterson are responsible for sorting the ballots from the precinct. They've been charged with arranging the ballots in the proper order, putting them in piles for Democrat Al Franken, Republican Norm Coleman and other candidates. As they start the process, representatives for Coleman and Franken stand behind Schallert as she quietly goes through the process. After some hiccups in how to handle the counting and sorting, the process starts to move along, and gets into a groove. The judges start sorting out loud. But it doesn't take long for the challenges to come at this table. Coleman's representative, Wayne King, challenges a ballot because he thinks the vote for Franken was crossed out. A minute and a half later, Franken's representative, Monte Jarvis, files his first challenge. "I want to challenge that ballot for the intent. I don't think the intent of the voter was to vote for Norm Coleman," says Jarvis. At the end of the sorting, Coleman's campaign had challenged two ballots. Franken challenged one. Minneapolis Elections Director Cindy Riechert comes over to examine the ballots. She talks with Coleman's lead representative, Pat Shortridge, about the ballot in question. "This one seems to me that that is a Franken vote, so that's where I would go with that," says Riechert. OK, that goes back in the challenge pile," Shortridge replies. Shortridge agrees with Reichert on the other ballot and decides not to challenge it. Franken's attorney also abandons its sole challenge after Reichert offers her opinion. The maneuvering resembles a game of high-stakes poker. One campaign places a challenge and the other ups the ante. Just when it appears they're ready to actually start counting the ballots, there's another hiccup. 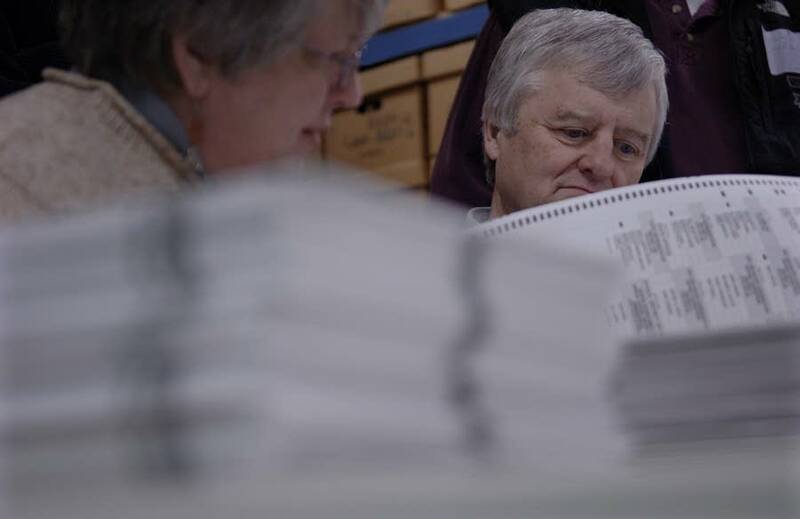 Elections officials order the sorters to go through the ballots again, after they realize they didn't tell them to disregard any ballots that would identify the voter. That sets off another flurry of challenges. 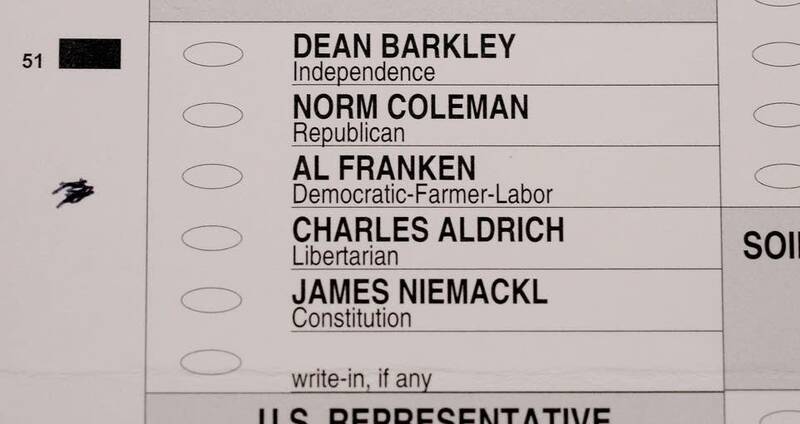 Franken's team challenges a ballot because it has the name Andrew Vick written several times as a write-in vote. Coleman's camp follows suit with three other challenges of similar nature. Reichert is called back over. She says she thinks all of the votes should count, but Franken attorney Matt Grill disagrees. "I don't know who Andrew Vick is. That's the thing," Grill says. "None of us do, he's the write-in candidate of this person's choice," Reichert responds. 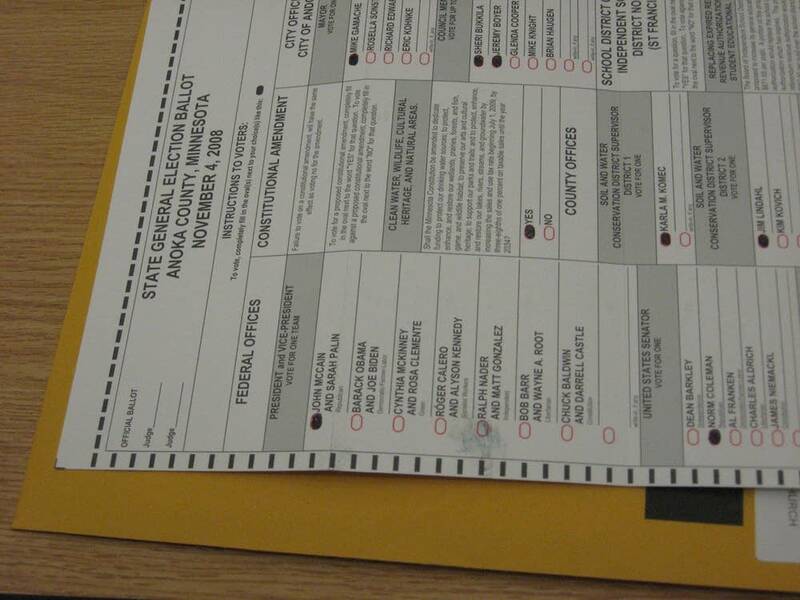 "Or it's this person who wrote his name all over the ballot," replies Grill. 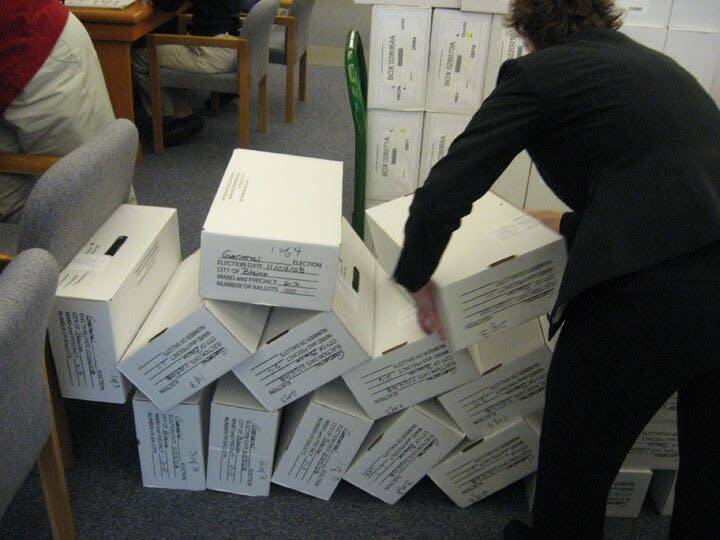 But there's no way of knowing, Reichert says, so she determines the ballot should be in the "challenged" pile. Reichert makes the same argument to Coleman's rep, Pat Shortridge, but he wants to challenge all three ballots. "Got to play by one set of rules," says Shortridge. "If they want to trade three for one all day, no problem." After all of the ballots are counted, there are 585 votes for Franken, 191 votes for Coleman and 147 votes for others. Coleman's campaign has challenged four ballots that were Franken votes. 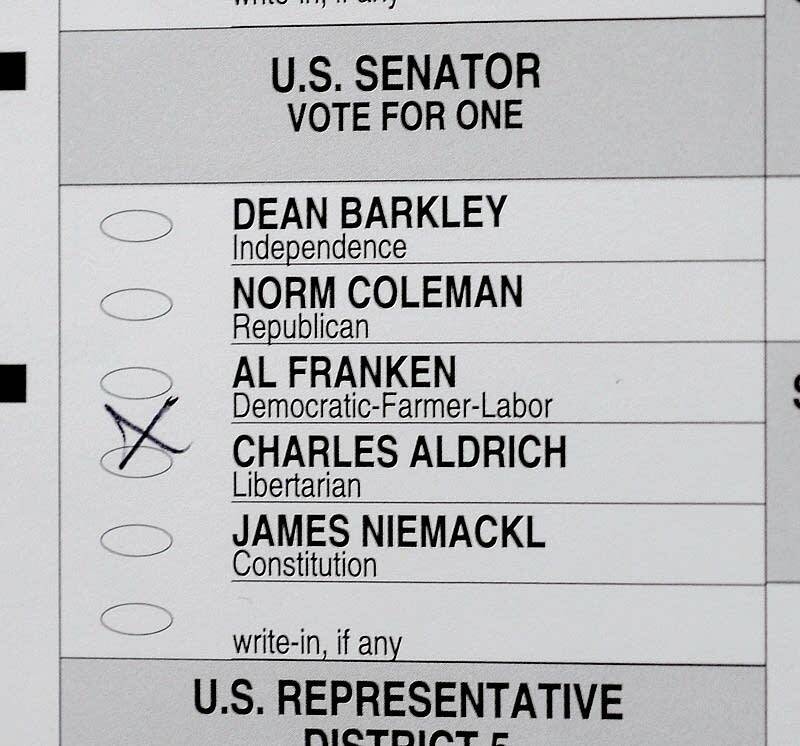 Franken's team has challenged one ballot that was a Coleman vote. So ends the counting in this precinct -- 928 votes recounted, out of 2.9 million cast statewide. Throughout the state, the process was playing out in a similar fashion. 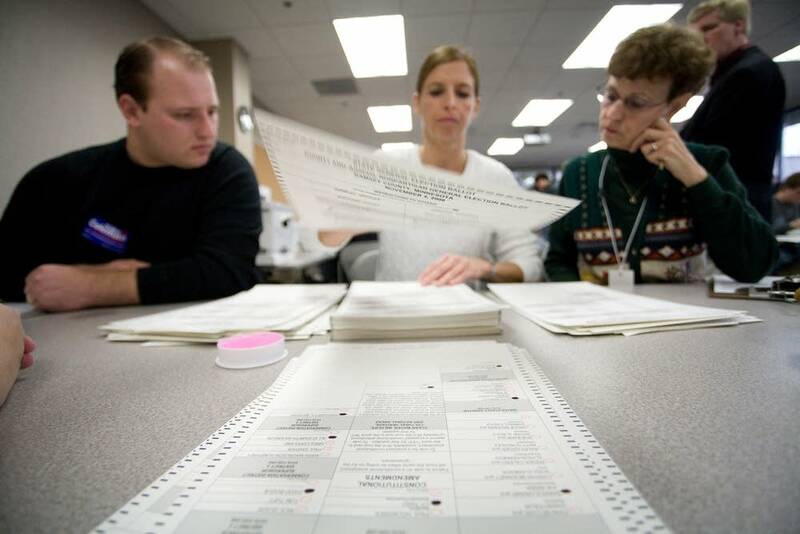 The board room at the Stearns County Administration Center was transformed into a recounting station. 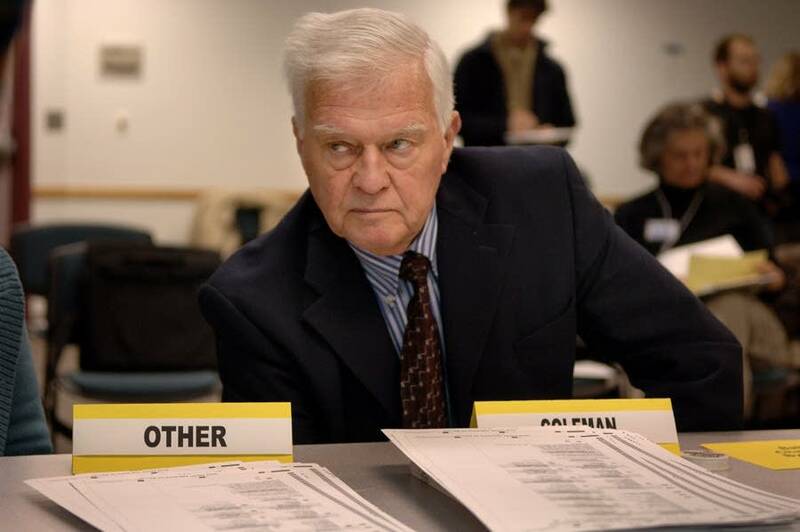 Elections officials set up five tables, each staffed by two ballot counters and a representative from the Coleman and Franken campaigns, both of which had two roving representatives. Three elections staff assisted with getting and distributing ballots and tallying up counts. One side of the room was taped off for public observation. Randy Schreifels, the Stearns County auditor treasurer, expected to finish about 20 percent of precincts by the end of today. Schreifels said it'll take about five days to complete the recount, but he said it's possible it may take longer than that. The county has to recount about 79,000 ballots total in 102 precincts. Seven ballots have been challenged so far -- four from the Franken campaign, and three from the Coleman campaign, including one that was flagged for voter fraud. Ballot counters said the writing, the manner in which the ballot was marked, and names written on the ballot were identical to another ballot in the same township. Schreifels said one possible explanation is that people can request assistance in filling out a ballot, so the same person may have assisted more than one voter. So far there haven't been any exceptional gains or losses for either campaign in Stearns County, with only a handful of precincts having one vote swing. Schreifels said the county is trying to make the recount process as open and fair as possible. The county Web site is streaming the recount process live. In Anoka County, elections officials set up 10 long tables in the board room to accomodate the recount. Each table was staffed by two neutral vote counters and a representative from the Coleman campaign and the Franken campaign. Campaign officials circulated around the room, answering questions from their volunteers. The first objection the campaigns raised was that the vote counters were moving too fast for their volunteers to get a good look at each ballot. The counters obliged. When a campaign decided to challenge a ballot, county officials and campaign operatives swarmed to the table. As the day opened, Elections Manager Rachel Smith said she hoped to count about one-third of the county's 180,000 votes on Wednesday. She doesn't think that's going to be possible now. In St. Louis County at the county courthouse in Duluth, about 30 people were present for the recount. With five stations and two employee per station, observers from Franken and Coleman sit opposite each other watching the recount. The Secretary of State did not recommend sitting opposite, because observers are then forced to read upside down, but nobody was complaining in Duluth. In Nobles County at the county courthouse in Worthington, by 2 p.m. 6,500 ballots had been counted. Officials were planning to finish the recount today of the total 7,720 total ballots. Later this afternoon, officials were planning to decide whether to stay late to finish the job. Some workers have expressed a preference to stay and get it done, so they don't have to return tomorrow. Of the 3,000 counted ballots, only three had been challenged -- two by the Franken campaign and one by the Coleman campaign. In Olmsted County, roughly 50 volunteers were studiously reviewing 76,376 ballots. Officials originally suspected they could recount all ballots within 12 hours. But Mark Krupski, who runs the county's elections, says that estimation now seems overly optimistic. County officials now say the recount in Olmsted County could take two days. Krupski says the process is slow going. "My hope would be that if we go until about 9 p.m. tonight, we can get about two-thirds of the way through. And then we've reserved some space for Friday, and we'll start again at 8 a.m. on Friday," said Krupski. 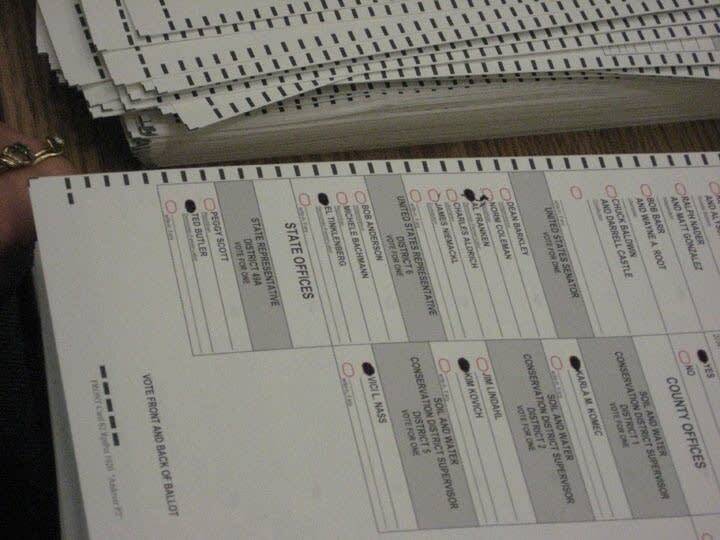 So far Krupski says election officials have only uncovered a few discrepancies in the ballots in Olmsted County.